Are you a young writer, poet or rapper? Raise Up and make your voice heard! The goal of “Raise Up” is to encourage youth from across the country to write original narratives about American education and high school drop out rates—and then to record them on video. Contest winners will be recognized nationally for their writing—and earn a $5,000 education scholarship, a trip to Washington, DC to perform at the Kennedy Center and the chance to have their poem or rap broadcast on National Public Radio. Local workshops and filming events: Coming Soon! Twice the Contests, Twice the Prizes, Twice the POWER! The Heritage Center is also hosting a local South Dakota competition in conjunction with the national contest. The rules and regulations are the same, but the prizes and opportunities are different (see below). If you live in South Dakota you will automatically be entered in both competitions, just send your entry in and we'll do the rest. See below for details on how to submit! To kick off the contests, The Heritage Center will be hosting free poetry and spoken word workshops across the Pine Ridge Reservation for youth ages 15 to 22. Participants will have the chance to work one-on-one with educators and teaching artists—and draft their own written narrative about the state of education and drop out rates on the reservation. Youth writers will then perform and record their narratives on video. Their video submissions will be shared with Youth Speaks and entered for a chance to win the national and local competition. Workshop dates are being set now—for more information on how to join or how you can host a workshop at your facility contact Brandie Macdonald at The Heritage Center at 605/867-5491 or by email at brandiemacdonald@redcloudschool.org. Workshop dates and times will be posted and updated regularly. Download a Flyer! Spread the Word! 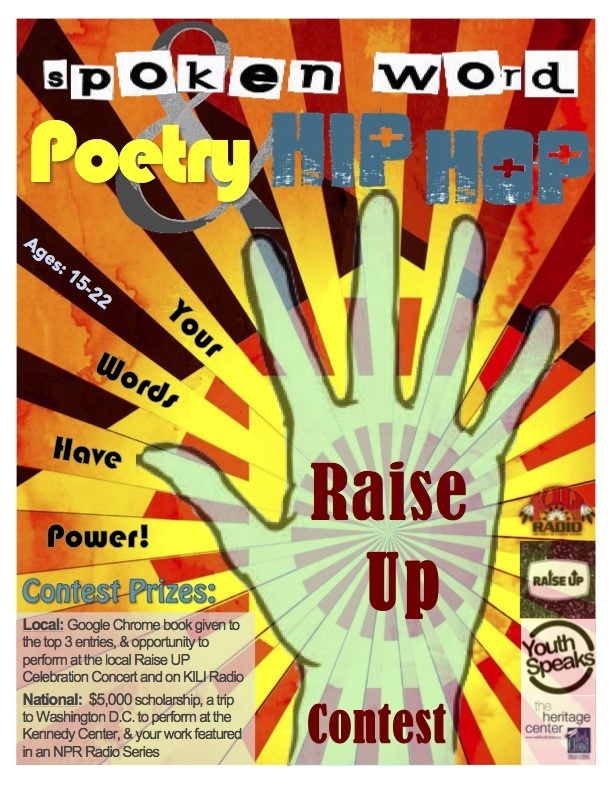 Raise Up is a spoken word, poetry, and hip-hop contest focusing on education and the high school dropout crisis. Raise Up is Youth Speaks’ national competition. The Heritage Center is partnering with Youth Speaks to provide support for local entries, a local Pine Ridge Reservation contest, and a local Raise Up Celebration Concert. We encourage youth to speak about successes, struggles, questions, stories related to graduation or dropping out, the current state of the education system and the dropout crisis happening within our communities. Every year, over 1.2 million students drop out of high school in the United States alone. That’s a student every 26 seconds – or 7,000 a day. Native American students have a dropout rate that is twice the national average and the highest dropout rate of any US ethnic minority. Pine Ridge Indian Reservation’s dropout rate is 70%; this is compared to South Dakotas’ 15%, and the national being 11%. Top 3 entries will win Google Chrome Books (laptops). Top 3 entries will get the opportunity to perform on KILI Radio and at the local Raise Up Celebration Concert on May 31st at The Heritage Center. First 50 entries will receive a Swag Bag including a signed CD of guest performing artists featured at the Raise Up Celebration Concert held in Pine Ridge, SD. A trip to Washington D.C to perform at the Kennedy Center. Your work featured in an NPR Radio Series. Video background noise is minimal. We want to hear you in this conversation. Providing supportive details, facts, and examples to enhance and/or back-up your message. All work must be original and of your own creation. All entries will be submitted to the National Competition. Local competition prizes will be limited to South Dakota resident entries. The local competition will be judged by 5 qualified judges from around the country. Entries must be submitted as video files with the Poet or Rapper vocalizing their lines. Film your video against a solid background (i.e. NO posters, street view, scenery, etc.) Don’t film anything other than a video of yourself performing your rap or poem. All entries may not exceed three minutes. NO music or sound effects other than your own voice. Contest is open to young people ages: 15 – 22. Make sure your video has good lighting. We want to see you in this conversation. Do your best to eliminate all background noise. If using a cell phone to record your video, put it on airplane mode. If using another camera to record, turn your cell phone off. Otherwise, your cell phone will interfere with the sound quality. All work must be 100% original and about the theme. Plagiarism will not be tolerated. Information to include in your email to Brandie: First and Last Name, Email, Phone Number, Address/City/State, School (if applicable), Age, Year of Birth, Title of entry.